Copyright © 1990-2013 by DisplayMate Technologies Corporation. All Rights Reserved. The Samsung Galaxy S Smartphones are by far the most popular Android Smartphones and are flagship products for Samsung to show off its latest and greatest OLED display technology. The display on the Galaxy S4 is a major enhancement and improvement over the Galaxy S III – it has a full HD 1920x1080 resolution display with 441 Pixels Per Inch. It is also better calibrated, brighter, and bigger. We’ll analyze the Galaxy S4 with an in-depth objective series of Lab tests and measurements included below. Samsung provided DisplayMate Technologies with an early production unit to test and analyze for our Display Technology Shoot-Out article series. It is likely that the retail units will have additional display firmware and software tweaks and improvements over our test unit. If that is the case, we will update the article when our unit is upgraded by Samsung. While most mobile displays are still LCD based, OLEDs have been capturing a rapidly increasing share of the mobile display market. The technology is still very new, with the Google Nexus One Smartphone, launched in January 2010, as the first OLED display product that received widespread notoriety. In a span of just a few years this new display technology has improved at a very impressive rate, now challenging the performance of the best LCDs. Virtually all of the OLED displays used in mobile devices are produced by Samsung Display. We have provided an in-depth analysis on the evolution of OLEDs in our Galaxy S I, S II, and S III Display Technology Shoot-Out article. To examine the performance of the Samsung Galaxy S4 we ran our in-depth series of Mobile Display Technology Shoot-Out Lab tests and included the Galaxy S III in order to determine how OLED displays have improved, and the iPhone 5 to determine how it compares to a leading high-end LCD display. We take display quality very seriously and provide in-depth objective analysis side-by-side comparisons based on detailed laboratory measurements and extensive viewing tests with both test patterns and test images. To see how far Smartphones have progressed in just three years see our 2010 Smartphone Display Shoot-Out, and for a real history lesson see our original 2006 Smartphone Display Shoot-Out. In this Results section we provide Highlights of the comprehensive Lab measurements and extensive side-by-side visual comparisons using test photos, test images and test patterns that are presented in later sections. The Comparison Table in the following section summarizes the lab measurements in the following categories: Screen Reflections, Brightness and Contrast, Colors and Intensities, Viewing Angles, Display Power Consumption, Running Time on Battery. You can also skip the Highlights and go directly to the Conclusions. By far the most interesting recent development in Smartphones is a full High Definition 1920x1080 display in a 5.5 inch or smaller screen size – the same pixel resolution as your 50 inch living room HDTV – that’s very impressive! First of all, this is a benchmark spec with tremendous marketing power for driving consumer sales. But there are other important reasons for going to Full HD in a Smartphone – there is a tremendous amount of HD 1920x1080 content available. Displaying that content at its native resolution (without the need to rescale up or down) results in the best possible image quality, plus rescaling requires processing overhead that uses (wastes) precious battery power. The Galaxy S4 is one of the first few Smartphones to offer Full HD. Apple started a major revolution in display marketing by introducing their “Retina Display” with 326 Pixels Per Inch (PPI) on the iPhone 4 in 2010. While not equivalent to the resolution of the human retina, people with 20/20 Vision cannot resolve the individual pixels when the display is held at normal viewing distances of 10.5 inches or more. It started a display PPI and Mega Pixel war similar to what happened with Smartphone digital cameras, which is still an ongoing wild goose chase now into the stratosphere… Hopefully the same thing won’t happen with mobile displays because there are tradeoffs involved that affect other important display performance issues. The real question is how high do we need to go before reaching a practical visual PPI limit? I’ll cover this in an upcoming article. However, a new generation of 400+ PPI displays is already here, driven by the desire to produce a Full HD 1920x1080 display on a Smartphone screen. The Galaxy S4 has an incredible 441 Pixels Per Inch. People with 20/20 Vision cannot resolve the individual pixels on a 441 PPI display for viewing distances of 7.8 inches or more, which is exceedingly close for viewing a 5.0 inch display. 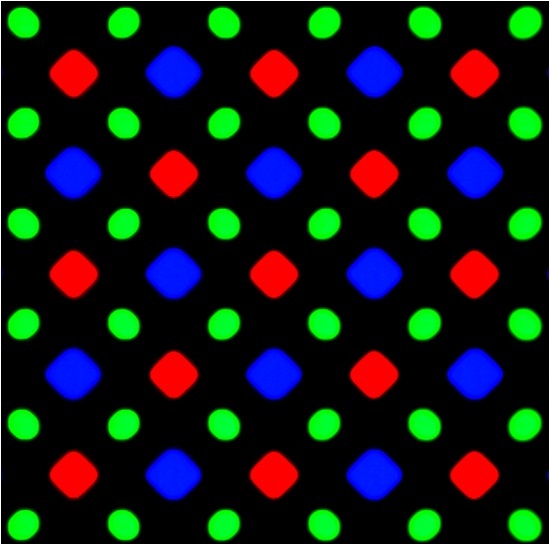 The pixels on most current OLED displays have only 2 sub-pixels in each pixel instead of the standard 3 Red, Green, and Blue sub-pixels found in most other displays and display technologies. Half of the PenTile pixels have Green and Red sub-pixels and the other half have Green and Blue sub-pixels, so Red and Blue are always shared by two adjacent pixels. This makes PenTile displays easier to manufacture and at a lower cost. It also improves brightness and reduces aging effects. Because the eye has lower visual acuity for color this works very well for photographic and video images. But for digitally generated fine text and graphics with precise pixel layouts the eye can visually detect the reduced number of Red and Blue sub-pixels unless the number of Red and Blue Sub-Pixels Per Inch is very high. And it is for the Galaxy S4 – there are 312 Red and Blue Sub-Pixels Per Inch, which is only a few percent lower than Apple’s Benchmark 326 PPI iPhone Retina Display. Visually the Galaxy S4 PenTile display delivers excellent visual sharpness across the board. Most consumers are not aware that LCDs are actually non-linear analog displays that perform really well only as the result of highly refined electronics and careful factory calibration. This is the same reason why even living room HDTVs provide coarse and imprecise color and image controls, and why professional calibration is desirable. One interesting technical development is that the latest OLED displays use digital Pulse Width Modulation to specify the brightness of every sub-pixel. This makes it possible for OLED displays like the Galaxy S4 to precisely vary and directly digitally control their Intensity Scales, Gamma values, White Points, color calibration and color management of the display in firmware or software. Plasma and DLP displays also use digital Pulse Width Modulation, but the OLED displays perform better because of higher frequencies and faster response times. One important application of the Digital Display Technology mentioned above is that this makes it relatively easy to provide a number of different display calibration options and settings that will appeal to differing consumer tastes and preferences under various viewing conditions and applications. The Galaxy S4 (like its bigger cousin the Galaxy Note II) includes 5 user selectable Screen Modes: Adaptive, Dynamic, Standard, Professional Photo, and Movie, which we discuss below and include measurements for the Standard and Movie Modes. The Galaxy S4 Movie Mode delivers the closest Color and White Point calibration to the standard sRGB/Rec.709 consumer content that is used for digital camera, HDTV, internet, and computer content, including virtually all photos and videos. Use the Movie Mode for the best color and image accuracy. Its Green primary is still somewhat too saturated – hopefully it will get toned down some as in the Galaxy Note II, which is very accurate. The Professional Photo Mode provides a fairly accurate calibration to the Adobe RGB standard, which is rarely available in consumers displays, and is very useful for high-end digital photography applications. The Standard Mode is the default mode for the Galaxy S4 – it delivers higher color saturation, which appeals to some, and is a better choice for high ambient light viewing conditions, which wash out image colors and contrast. This mode is very similar to the Professional Photo Mode, but has a more bluish White Point. Its Green primary is also too saturated, but noticeably less than in the Galaxy S III. The Dynamic Mode produces the most vibrant image and picture quality. Compare the Color Gamuts in this Figure and below. OLED displays are generally not as bright as the brightest LCD displays. There are two reasons for this: first, while OLED power efficiency has been steadily improving they are not yet as power efficient as the best LCDs. Second: there is a marketing obsession for producing ultra thin and light weight Smartphones, which sacrifices much needed battery power. Since the display often uses 50 percent or more of the total Smartphone power, various display power management schemes are frequently used. The Galaxy S4 uses one innovative approach to overcome this – when Automatic Brightness is turned on, the Peak Brightness becomes significantly brighter in high ambient lighting than is possible with Manual Brightness, up to as high as 475 cd/m2, which is 34 percent higher than is possible with Manual Brightness. This is done so that users can’t permanently set the brightness to very high values, which would run down the battery quickly. Smartphones are never used in the dark. In fact, they are often used in very bright ambient lighting, which can significantly degrade and wash out their image and picture quality. The Galaxy S4 performs very well in high ambient lighting in spite of its typically lower screen brightness because it has one of the smallest screen Reflectance values of any display we have ever tested, and its more saturated colors can help cut through the reflected light glare. When Automatic Brightness is turned on, the screen brightness increases considerably at high levels of ambient lighting as mentioned above. The Galaxy S4 is then comparable or brighter than most LCD Smartphones, but still 15 percent less than the much smaller iPhone 5, which is the brightest Smartphone we have tested. The Galaxy S4 display is a major enhancement and improvement over the Galaxy S III – a good reason to consider trading up. The screen has Full HD 1920x1080 resolution with more than double the number of pixels and with 44 percent higher Pixels Per Inch than the Galaxy S III. It is 25 percent brighter (and up to 68 percent brighter with Automatic Brightness) and the display is 20 percent more power efficient. The Galaxy S4 also has 5 user selectable Screen Modes and delivers much better picture quality and color accuracy. Of course, LCDs are not standing still either. There has been a remarkable increase in their resolution and Pixels Per Inch. IGZO and more advanced Metal Oxide backplanes will help to significantly improve their efficiency and performance. Quantum Dots should help them to efficiently enlarge their Color Gamuts to catch up with OLEDs, which is important for delivering accurate color and image contrast in high ambient lighting. All Smartphone and Tablets displays can be significantly improved using DisplayMate’s advanced scientific analysis and mathematical display modeling and optimization of the display hardware, factory calibration, and driver parameters. We help manufacturers with expert display procurement and quality control so they don’t make mistakes similar to those that are exposed in our Display Technology Shoot-Out series. We can also improve the performance of any specified set of display parameters. This article is a lite version of our intensive scientific analysis – before the benefits of our DisplayMate Display Optimization Technology, which can correct or improve all of these issues. If you are a display or product manufacturer and want to significantly improve display performance for a competitive advantage then Contact DisplayMate Technologies. Below we compare the display on the Samsung Galaxy S4 with the Samsung Galaxy S III and Apple iPhone 5 based on objective measurement data and criteria. For additional background and information see the Flagship Smartphone Display Technology Shoot-Out between the iPhone 5 and the Galaxy S III, and the Samsung Galaxy S OLED Display Technology Shoot-Out that compares and analyzes the evolution of the OLED displays on the Galaxy S I, II, and III. same shape as widescreen HDTV video content. Screen Area relative to the Galaxy S4. At 12 inches from the screen 20/20 vision is 286 ppi. and Blue Sub-Pixels as standard RGB displays. Number of Kilo Sub-Pixels KSP for Red, Green, Blue. where the screen appears perfectly sharp to the eye. Samsung Galaxy S4 and S III do not have this issue. to a calibrated studio monitor and HDTV. smaller color shifts than the Galaxy S4. The Galaxy S4 and iPhone 5 are both Best of Breed. accurate calibration than the Movie Mode. excellent displays for the current generation. matte or haze surface finishes. that has a 50% Average Picture Level. all white with 100% Average Picture Level. has only a tiny 1% Average Picture Level. have higher Brightness in Auto Brightness Mode. affects both image brightness and color mixture accuracy. Average Picture Level. Ideally should be 0 percent. based on how the Smartphone is held, and the angle can be very large if the Smartphone is resting on a table or desk. Most screens become less bright when tilted. OLED decrease is due to anti-reflection absorption..
LCD brightness variation is generally very large. IPS LCDs have smaller color shifts with angle. Color Shifts for non-IPS LCDs are about 10 JNCD. The display power was measured using a Linear Regression between Luminance and AC Power with a fully charged battery. that is entirely all Peak White. with no running applications, and with Auto Brightness turned off. All Smartphone and Tablet displays can be significantly improved using DisplayMate’s advanced scientific analysis and mathematical display modeling and optimization of the display hardware, factory calibration, and driver parameters. We help manufacturers with expert display procurement and quality control so they don’t make mistakes similar to those that are exposed in our Display Technology Shoot-Out series. We can also improve the performance of any specified set of display parameters. This article is a lite version of our intensive scientific analysis – before the benefits of our DisplayMate Display Optimization Technology, which can correct or improve all of these issues. If you are a display or product manufacturer and want to significantly improve display performance for a competitive advantage then Contact DisplayMate Technologies. DisplayMate Technologies specializes in proprietary sophisticated scientific display calibration and mathematical display optimization to deliver unsurpassed objective performance, picture quality and accuracy for all types of displays including video and computer monitors, projectors, HDTVs, mobile displays such as smartphones and tablets, and all display technologies including LCD, OLED, 3D, LED, LCoS, Plasma, DLP and CRT. This article is a lite version of our intensive scientific analysis of Smartphone and Smartphone mobile displays – before the benefits of our advanced mathematical DisplayMate Display Optimization Technology, which can correct or improve many of the display deficiencies. We offer DisplayMate display calibration software for consumers and advanced DisplayMate display diagnostic and calibration software for technicians and test labs.